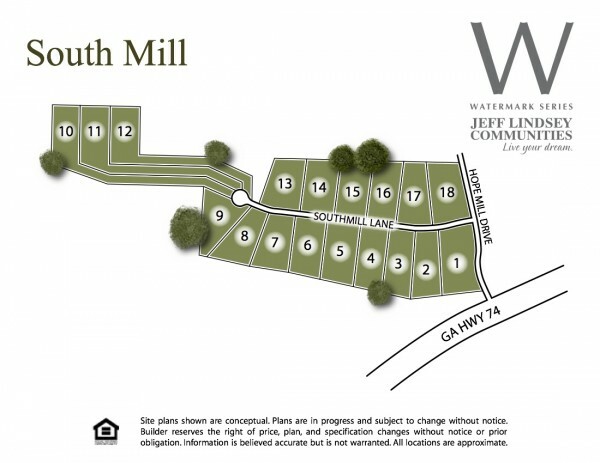 Welcome to our newest community, South Mill! A premier community nestled in the heart of the Stars Mill school district, this stellar community is sure to sell out quickly! Located near Peachtree City and downtown Senoia, this location offers the convenience of shopping and first-rate restaurants in addition to convenient access to I-85. Speak to our agent, Vee Jokjohor, today for more information! Directions: From Fayetteville: Take GA HWY 85 South toward Senoia. Go past intersection of HWY 85 and HWY 74. One past the intersection, South Mill will be on the right. Directions: From Peachtree City: Take GA HWY 74 South. Turn right onto HWY 85 South, South Mill will be on the right. South Mill will be on the right.